DISCLAIMER: I am not an expert in astronomy or physics. If you spot factual or numerical errors below, please report them in the comments section. If you have corrections to empirical distances or object data, please cite upto date authoritative references (ie. not Wikipedia), as I believe I have used the most recent accurate data available. Some figures have been deliberately rounded for simplicity and may contain rounding errors. This document is in its 3rd draft and is not yet complete. Welcome to chapter 3! In this chapter I’m going to talk about the scale of the Universe – that is, how big and old it is. I’ve put off writing this chapter for almost a year. Part of the problem is that there is so much diversity around us that it’s impossible to summarise in a few pages. Another problem is how to describe and visualise the huge distances and times we’re going to look at – and that’s where we shall begin. I’ve come to the conclusion that it is not possible for any human to truly comprehend not only the size and age of the Universe, but even of our own galaxy (a tiny part of the Universe), or even of our little corner of the galaxy. At your disposal you have an unlimited supply of $20 bills (we can all dream!). You are asked to stack approximately 1 million dollars upto the height of your waist. If I give you a piece of chalk, can you draw a rectangle on the floor which roughly shows the area of the floor the stacks of bills will cover? What if they were $5 bills? What if you were asked to count out 5 million dollars? Is it as easy as it sounds? The circumference of the Earth at the equator is about 40,000km (24,900 miles; I’m going to use kilometres in the rest of the article; 5 miles is equivalent to 8 kilometres). Sounds reasonable – how long would you guess it takes to walk around it if there were no oceans to stop you? Can you visualise the answer without using a calculator? If the average walking speed is 2mph and you walk non-stop 24 hours a day without eating, sleeping or going to the bathroom, and ignoring all weather conditions, you’re looking at about 1 year and 24 weeks. How many pieces of A4 paper would you need to lie end to end to stretch all the way around the world and make a loop? A4 paper measures 210x297mm so you’ll need about 135 million sheets. 135,000,000 sheets – look at your box of 500 or 1000 sheets on your office shelf. Can you visualise what 135,000,000 sheets would look like? Can you visualise how far they would stretch out in front of you if laid end to end? We’re all familiar with World War I and II, and we know how long ago they were even if we weren’t alive at the time. I think most of us can visualise back to this time using milestones we personally know of (even if we didn’t experience them ourselves), such as 70s music, the introduction of colour TV, the stock market crash of 1929 etc. You may have your own milestones. But what about even just 100 years before that? Almost everything we are familiar with in our lifestyles – the industrial revolution – came about in the 20th century. Can you think back to 1800 and imagine the state of humanity then? What about the American civil war and declaration of independence (1776), the battle of Hastings (1066), the birth of Christ (approximately 0 AD – no corrections please, we all know this is not precise and the Gregorian calendar wasn’t used back then). We can certainly draw them on a timeline, but when we look at ancient Roman, Greek, Egyptian ruins, can we really visualise when it happened and how human development has progressed since? If we have trouble thinking back 2000 years, we have no hope of comprehending the massive spans of time before that where many notable things happened. The last Ice Age ended approximately 13,000 years ago. The ancestors of humans existed approximately 4,400,000 years ago; the first humans came about approximately 400,000 years ago2 (Adam and Eve fans: sorry to disappoint you, we have found fossils this old, Adam and Eve is widely accepted as metaphorical and disproven even among the religious community). Dinosaurs ruled the earth from approximately 250 million (250,000,000) years ago to 65 million (65,000,000) years ago1. How long ago is that really? About one million times the length of time between Christ’s birth and now. If you think about how human development has changed in the last 2,000 years alone, how can we possibly imagine 1,000,000 times further back than that, or 20,000 times further back than the last Ice Age? Amazingly, we have not yet even come close to the scales of time I’m going to discuss in this article. The first organisms (life) on Earth are believed to have emerged between approximately 3.5 and 4 billion years ago. 1 billion is 1000 million (US billions, the most commonly used version of a billion), so that’s 3,500,000,000 years ago3. The number is so large it is, in my opinion, impossible to imagine. Think back to our 135,000,000 million sheets of paper to wrap around the Earth to consider just how hard and monstrously huge this visualisation is. The age of the Earth is approximately 4.5 billion years (4,500,000,000 years). That’s 10,000 times older than when the humans are thought to have emerged, and about 70 times older than the extinction of dinosaurs. Yet, Earth is a relative child compared to the Universe, which is estimated to be approximately 13.7 billion (13,700,000,000) years old – more than 3 times older than the Earth. History shows us that alot can happen in 100 years. Alot can happen in just one year. How much can happen in 13.7 billion years? Some of you may fare better at these mind games than others, but the general concept is that we have trouble visualising quantities or sizes of objects we are familiar with, and all of these objects are incredibly small compared to the size of even the littlest corner of the Universe, it’s not feasible to try and visualise it. Science can give us the numbers (the distances), and we can certainly make useful deductions – like how long it will take a spaceship to get there – but as humans, unless we make the trip ourselves, we are completely hopeless at understanding exactly how much, how big, how long or how far we’re actually talking about. The important thing to note here is that, as far as our existence is concerned, everything happened in the last 2 seconds, that is to say, the Universe is over 43,000 times older than the ancestors of humans, and 430,000 times older than the first humans themselves. How on Earth (no pun intended) can we possibly comprehend that? 1 billion = 1000 million. 1 trillion = 1000 billion. 1 mile = 1.6km (5 miles is 8 kilometres). For measuring nearby objects, or objects within a single star system, we commonly use the Astronomical Unit or AU. 1 AU is precisely the distance from the Sun to the Earth’s average orbit, which is 149,597,871km (about 150 million kilometres, or 93 million miles). For measuring the distances between stars and galaxies, we use a larger unit called the light year or LY. One light year is precisely the distance light travels in one Earth year (365.25 days). Light travels at an astonishing 299,792km (about 300 thousand kilometres) per second, which means it travels 9,460,528,400,000km (9.5 trillion kilometres) per year. 1 light year is about 63,000 times further than 1 AU, in other words, in 1 year, light travels 63,000 times the distance between the Sun and the Earth. This may seem alot, but in the grand scheme of things, it is actually very slow, to the point where it hinders our ability to make new discoveries about the Universe. Please note: The graphs below are based on earlier work in which I used slightly different values for 1 AU and 1 LY, so they are not entirely accurate; however for the purposes of this article, the differences are so small as to be insignificant, since we are measuring relative rather than absolute differences in distance. Before we get into how big the Universe is, it’s helpful to have a rough idea of how it is organised, so when we talk of stars, planets and galaxies, we know how things fit together and have a sense of the Universe’s overall structure. I’m not going to go into why things became the way they are here (how the Universe was formed and evolved), I’m just going to summarise how it is at the moment so you have the big picture. In a nutshell, you can think of the Universe like a huge ball (like the Earth but ’empty’), and everything that makes up the Universe goes inside (like how a balloon is filled with air or helium). Don’t worry what lies outside the ball for now – there is an answer to that and I’ll come to it in a later article. The ball is full of galaxies. The galaxies are all moving around in different directions at different speeds, but on the whole they are all moving away from the centre of the ball and the ball is getting bigger all the time. A galaxy is nothing more than a large collection of stars. The stars in each galaxy orbit (rotate) around the centre of the galaxy, usually in a circular or elliptical motion. Some stars have other objects orbiting them, such as planets, asteroids, comets or simply clouds of dust and gas. The distinction between them isn’t important here, all that’s important is that some stars are orbited by other objects. The objects can be at different distances to the star and travel at different speeds. A star or small group of very nearby stars, plus the objects that orbit them, is called a star system or solar system. For an example we all understand: our galaxy is called the Milky Way, and the Sun is a single star in that galaxy. Earth and the other planets like Venus and Jupiter orbit the Sun. This collection of objects, ie. the Sun, Earth and other orbiting planets, is an example of a star system. As a rule of thumb, each star system is far away from all the other star systems, meaning that they never crash into each other or have their trajectories (paths of movement) altered by the gravity of the closest neighbouring star system. Similarly, all the galaxies (collections of stars and star systems) are far away from all the other galaxies, so they don’t usually collide either. Some pictures should help make things easier! 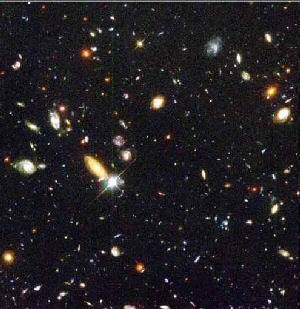 Figure 12 shows what the Universe might look like from afar – if figure 12 is the ball, then you can see all the galaxies inside. Figure 6 shows you one galaxy up close: the one we live in, the Milky Way. All the little dots represent stars, which are orbiting around the big bulge in the middle. Figure 7 is the same as figure 12 except that it’s a diagram looking down on the Milky Way from above. You can see the position of the Sun on it, about 2/3rds away from the centre. Zooming in closer, figure 2 shows the Sun with the Earth and other nearby planets orbiting around it. This is the star system which we inhabit. It’s easiest for us to zoom in from the Universe to our galaxy to our star system, because they’re the areas of space we know most about. But if you were to zoom in on any other galaxy, and then on any random star system in that galaxy, you would get about the same results. Sometimes there will be no planets, sometimes there will be two or three stars, sometimes there will just be asteroids orbiting the star, but the overall structure is about the same, wherever in the sky you look. Now let’s talk about size. If you thought the numbers for the length of the Universe’s history were big, you’re in for a shock: the distance spanned by the known Universe is so vast, it makes its age look tiny. Very tiny. And the Universe is expanding at an increasingly fast rate. It’s getting alot bigger every day. In this journey, we’re going to head in the opposite direction from before; we’ll start on our home planet Earth, and make our way to the edge of the known Universe. Figure 1. The Earth as seen from the manned Apollo 17 spacecraft on its way from the Earth to the Moon between 7th and 11th December 1972. The photo was taken by astronaut Harrison Schmitt. We live here, on the Earth, an insignificant planet in an insignificant star system, in an insignificant location of an unremarkable galaxy. Figure 1 shows what the Earth looks like from nearby space. We used to think the Earth was flat. Actually, it’s round, roughly spherical (a sphere is a 3D circle, like a tennis ball). It is about 40,000km around its edge (the circumference), and if you were to drill a hole from one end to the other right down the middle, like the fictional idea of drilling down from the UK to Australia, you would drill a hole 12,756km deep (the diameter, across the equator). We used to think the Earth was the centre of the Universe and that everything revolved around it. In fact, like all the other planets in the Solar System, Earth orbits our local star, the Sun. The Earth is a relatively small planet as far as our star system goes; Jupiter, Saturn, Uranus and Neptune all dwarf it in size, as well as the Sun which is the biggest object of them all with a diameter (drill-down-the-middle) size of a whopping 1.4 million kilometres (1,400,000km)4 – more than 100 times the size of Earth. And yet it looks so small in the sky! Earth is “special” because it is the only planet we currently know for sure has liquid water on its surface – a crucial pre-requisite to life as we know it – however the chance of other planets in the Universe also harbouring water should be 100%, ie. absolutely certain – based on the fact our planet has been repeatedly found to be insignificant in all the other ways we thought it used to be special, the fact we have discovered ice on many other worlds, and the fact that there are so many planets in the Universe, it would be extremely arrogant to assume we are the only ones with liquid water available. The Solar System is our fancy name for the star system we inhabit, which is about as insignificant as the Earth itself. For many of us – especially in our younger years – the Solar System is pretty much everything we know about space. Most of us think we know roughly how the Solar System is made up, that Neptune or Pluto is the planet furthest away, and we have – as laymen – no idea what lies beyond. The Solar System is such a tiny part of the Universe it is incomprehensible, as we shall see shortly. 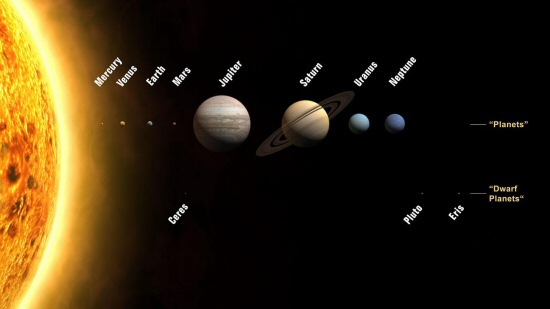 Most of us think of the Solar System as the Sun plus 8 or 9 planets; in increasing order of distance from the Sun: Mercury, Venus, Earth, Mars, Jupiter, Saturn, Uranus, Neptune and Pluto. A few common mistakes: the Sun is not a planet, it is a star. A simple distinction between a planet and a star is that a star produces energy via nuclear reactions (generating light and heat), whereas a planet does not. The Moon is also not a planet, because a planet by definition has to orbit a star, but the Moon orbits the Earth. Objects orbiting planets are sometimes called moons, but are more commonly known as satellites, just like the manmade satellites we launch into orbit around the Earth. The differences between our satellites and the Moon is that the Moon has been made by nature, and the Moon orbits from much further away. The average distance between the Moon and Earth is about 250,000 miles (a quarter of a million miles or 400,000km), whereas manmade satellites orbit much closer. The International Space Station (ISS) orbits between about 320km and 350km above the Earth, and circles the Earth about every 90 minutes. Most satellites orbit less than 2000km above the Earth5. Many of us have satellite dishes to pick up TV signals; in order for us not to have to keep moving these dishes to point at the TV satellite, these satellites have to always appear – to us, on Earth – to be at the same place in the sky all the time, so our dishes can always point in the same place. To do this, we have to place the satellite in orbit at a very precise height so it orbits around the Earth at exactly the same speed the Earth itself rotates each day. This orbit is called geostationary orbit and is approximately 37,000km from the Earth. Notice this is only about 1/10th the distance from the Earth to the Moon, and the regular satellites are a mere 1/200th (one two hundredth) of the distance from the Earth to the Moon. The fact our Earth only has one natural satellite (the Moon) is purely coincidental. Many planets have lots of moons, or even none at all. Mercury and Venus – the two planets closest to the Sun – don’t have any moons. Jupiter – the largest planet in the Solar System – has a whopping 63 moons and more are being discovered as time goes by6. The most recently found 60th moon of Saturn was discovered as recently as 2007 (many of the later-discovered moons of Saturn have diameters of only 2km or less). There’s much more to the Solar System than you’ll be commonly taught at school or on Discovery Channel. First of all, between Mars and Jupiter is a region of space called the asteroid belt. This is a thick layer of dust and asteroids which orbit the Sun. Many planets start out as spread out rings of dust and debris like this, and later coalesce (get glued together) into a big ball and form a planet. It is probable that the planets we know of today in our Solar System were formed in this way over very long periods of time. Pluto was discovered in 1930 and has long been considered to be the outermost planet in the Solar System. In 2006, an expert panel of scientists at the International Astronomical Union10 held a conference and changed the way we decide whether to classify objects in space as planets or something else. There was much contraversy and disagreement about what constitutes a planet and what consitutes an asteroid in the scientific community, as previously, apart from the size of the object, there were no real differences (I’m simplifying again before someone corrects me!). Pluto was re-classified in 2006 as part of a new group of objects called dwarf planets. Simplified, these are basically objects not considered big enough to be a full-blown planet, but are bigger than the largest asteroids. Also of great importance to the new rules is that the orbits of planets in a star system should not intersect (cross paths with) the orbit of any other planet. In our Solar System, for example, the orbit of the Earth is always outside (further away from) the orbit of Venus, but always inside the orbit of Mars. This effectively means their paths never cross and they can’t collide with each other under normal circumstances. All of the planets in our Solar System have orbits like this, which can be thought of like a series of rings around the Sun, increasingly bigger but never crossing each other. There is one exception: Pluto. Pluto’s orbit crosses Neptune’s orbit, because it is thinner and longer than Neptune’s, and this situation prohibits Pluto from being considered a planet under the new rules. This move introduced another interesting change. The largest object in the asteroid belt between Mars and Jupiter – an asteroid known as Ceres – is now also thought of as a dwarf planet, being too large under the new rules to be considered an asteroid. So we now include this in our list of major objects in the Solar System. The asteroid belt also contains some other large asteroids including Vesta and Hygieia. When the orbits of these objects are studied further, they may also be re-classified as dwarf planets. They’re not shown on the diagram in figure 2 because their status as dwarf planets hasn’t been confirmed yet. Pluto has three moons but one of them – Charon – is of particular interest. It seems that Pluto and Charon actually orbit each other in a circle while they both also orbit the Sun, rather than Charon orbiting Pluto directly. Charon may therefore be re-classified as a new dwarf planet in the near future. More recently on 21st October 2003 – and a full 73 years since the last planetary discovery in the Solar System (Pluto) – another new dwarf planet was discovered. Originally called 2003 UB313, in September 2006 this cold icy world was officially named Eris17. Eris is almost twice as far away from the Sun as Pluto – that is to say, if you take the enormous distance between the Sun and Pluto – which most ordinary people consider to be where the Solar System ends – and travel the same distance again, you will go through a long patch of empty space then eventually bump into Eris! Eris is also a little bigger than Pluto – about 25% larger. In fact, Eris is not even close to where the Solar System is now actually thought to end by scientists, but for most people, this finding immediately doubles the size of the Solar System in our minds. Hopefully, by the end of this article, you will have a much better idea of just how small a space the distance between the Sun and Eris (or the Sun and Pluto) is compared to the real size of the Solar System. Figure 2. Currently known planets and the largest known so-called dwarf planets in our own solar system. It’s important to note that the Sun and planet sizes are shown to scale, but the distances between them are not to scale. The main planets are shown across the centre while the dwarf planets are shown underneath. This is not the way they are oriented in reality. Figure 2 shows to scale the approximate sizes of each planet. As you can see, Jupiter and Saturn are very large compared to Earth, but Earth is bigger than our immediate neighbours Mercury, Venus and Mars. The actual distances between them are shown in Figure 3. The Earth is 150,000,000km from the Sun (150 million kilometres) – that is to say, the Sun is about 400 times further away from us than the Moon. Mercury, Venus, Earth and Mars are relatively close by, but as we get further away, there are increasingly large gaps of empty space between the next planets – that is, for each planet you want to travel to, you have to go further than the distance you travelled to the one before it. Of interest is that Jupiter, Saturn, Uranus and Neptune are not actually made of rock like the other planets – they are made of gas, which means if you tried to land a spaceship on them, you’d fall right inside! In fact, you’d die pretty quickly because the extreme temperatures and poisonous gasses inside would kill you, so they aren’t such friendly neighbours after all. These planets are called gas giants and they are quite numerous all over the Universe. Jupiter is the largest planet in our Solar System – about 11 times bigger (wider at its centre) than Earth. Jupiter’s famous “red spot” is an enormous and very long-lasting storm which is larger than the entire Earth! Figure 3. The distance from the Sun to the known planets and dwarf planets in our solar system, along with other notable areas such as the asteroid belt between Mars and Jupiter, and the Kuiper belt which lies beyond Neptune. Saturn is famous for its rings, which are mostly larges swathes of ice crowded so densely together that they look like smooth and beautiful rings circling the planet. What is less known is that Jupiter, Uranus and Neptune also have rings, but they much thinner and not visible to the naked eye16. The composition of the rings around each planet is different – those around Jupiter are thought to be made of rock rather than ice. Other planets may also have rings which we have not yet detected. One of the things that has always excited me is one of Saturn’s 60 currently known moons23 named Titan, which until recently was the only known object in the Solar System to have a somewhat Earth-like atmosphere (more recently, another moon of Saturn called Enceladus has also been found to have a similar atmosphere). In Titan’s case, this means that if you walked around on this moon, the sky would look blue, just like on Earth! You would also be able to see Saturn and its rings, which would almost fill the sky. I am sure this would be a fantastic and humbling sight for any human lucky enough to make the trip. The further away you get from the Sun, the less heat each planet receives from it. Mercury and Venus are constantly scorched at very high temperatures on one side due to their closeness to the Sun, making habitation impossible. In the outer reaches of the Kuiper Belt (see below) and the dwarf planets Pluto and Eris, we find frozen icy worlds at extremely cold temperatures – also uninhabitable by life as we know it. Earth is in a “sweet spot” where the temperature is just right for human evolution, the growth of crops and so on – astronomers call this the habitable zone and one of the key criteria when looking for other planets which may support life is to check they are in their orbiting star’s habitable zone too. In our Solar System, manmade climate change is destroying this fine balance very quickly and we will shortly find ourselves extinct if we do not change our behaviour to live more in harmony with nature. Just past Pluto’s 39 AU orbit is the Kuiper Belt, a 20 AU-thick region of icy asteroids, which until recently was the furthest known extremity of the Solar System. At an average of 6,000,000,000 (6 billion kilometres; or 40 AU) away from the Sun, that is 40 times further away from the Sun than Earth is. That’s a pretty long trip! The New Horizons spacecraft7 launched in 2006 to explore Pluto and the Kuiper Belt is scheduled to arrive at Pluto in the summer of 2015 – a 9-year trip. The spacecraft moves increasingly fast as it goes, leveraging the gravity of planets like Jupiter to whip around them and gain a substantial speed increase. New Horizons is a relatively sophisticated piece of equipment whose path can be re-programmed using radio signals even while it is in flight. When we look at the rest of the Universe, however, you will see that if it take 9 years just to get to Pluto, exploration far beyond this will be practically hopeless with current propulsion technology. Pluto and Eris are considered to be part of the Kuiper Belt due to their orbits and distance from the Sun; these and other related objects are known as Kuiper Belt Objects or KBOs. A few other large objects similar to Eris in size can be found in the Kuiper Belt – Orcus, Quaoar and some presently unnamed objects. These may also be re-classified as dwarf planets in the near future. I tried to think of the smallest and largest everyday objects most of us can identify with. It turns out this is alot harder than it sounds. After talking with my friends about hot air balloons, aeroplanes, cruise ships and the Empire State Building, I decided to use football pitches and grains of salt to help visualise the Universe. The following measurements are not important for the layman and are only so that enthusiasts can see how I arrived at the numbers in the article. A FIFA-standard size football pitch is exactly 110 yards, which is 100.5839998m. I used 0.3mm as the average diameter of a grain of salt (50% sodium and 50% chlorine) and 12,756.3km as the diameter of the Earth. If the Earth is the size of a grain of salt, we are scaling it by a factor of 2.35178E-11, which if we go the other way (if the Earth is not scaled but the football pitch is scaled up) leads to a football pitch with a length of 4,276,932,257km (4.3 billion kilometres). To give you an idea of the distances between the planets in our Solar System, imagine that the Earth was the size of a grain of salt. If you take a ruler with millimetres marked on it, look at 1mm and then make it 3 times smaller in your head – that is about the size of a regular domestic grain of salt used in households. Now let’s imagine that space is a football pitch. Put the Sun in the left-hand goal mouth. How far across the pitch do we have to travel in a straight line – towards the right-hand goal – to reach each planet? Mercury, Venus, Earth, Mars, Ceres and the asteroid belt are all found in the left-most tenth of the pitch; a pitch is about 100m long in reality so all these objects are crammed into the left-most 10 metres. Jupiter is almost twice as far from the goal at 18 metres. Saturn is almost twice as far again at 33 metres. Uranus is twice as far again at 69 metres – now we’re more than two-thirds of the way across the pitch. Neptune is actually more than one football pitch away – we’ve gone past the right-hand goal line and we’re now ploughing through the stadium audience, Neptune being 1.05 times the distance from the Sun as a football pitch. Pluto and the Kuiper belt are beyond the stadium and car park and a few streets away at 1.37 and 1.4 football pitches from the Sun respectively. Eris – the most distant dwarf planet in the Solar System we’ve mentioned so far, is almost twice as far away from Pluto at 2.38 football pitches. To put this into perspective, remember the visualisation exercises at the start of the article? Well, a grain of salt is almost 200 billion times smaller – 200,000,000,000 – than the Earth. By now, we poor humans are pretty lost at trying to imagine these kinds of distances – and disturbingly, we haven’t even begun to scratch the surface even of our own galaxy yet. Our galaxy – the Milky Way – contains several hundred billion star systems not remarkably different from our own Solar System, and most of these have huge gaps of empty space between them – many thousands of times the size occupied by the star systems themselves. So far in this artivcle we’ve only looked at the first 68 AU of our Solar System from the Sun (Eris, at 10,200,000,000km away; or if you prefer to use Pluto as a benchmark, 39 AU or 5,850,000,000km away) – the disturbing truth is that our Solar System is now thought to be approximately 426 AU in size – 10 to 20 times the distances we’ve looked at so far – but the distance to our next nearest star (Proxima Centauri – the nearest ‘Sun’ to our own) is almost 41 trillion kilometres away – 41,000,000,000,000km – or 4.22 light years or a staggering 271,931 AU away. That’s more than 5,000 times the distance from the Sun to Pluto, or more practically, more than 500 times the distance from the known edge of our Solar System. 500 times the size of our Solar System, of empty space, before the next solar system. Can you imagine that? To go back to our football pitch analogy, where Pluto is 1.37 football pitches from the Sun and Eris is 2.38 football pitches away, the edge of our Solar System is about 15 football pitches from the Sun (out on the suburbs of the town), whereas the next star system is a disturbing 9,500 football pitches away (950km away from the stadium, so, probably in the sea or a neighbouring country or state depending where you live). This should help you to understand why exploration outside our own tiny corner of space is a somewhat tricky prospect, to say the least. Figure 4. The distance from the Sun to notable objects in our outer solar system – the dwarf planet Eris, the largest known object between the Kuiper belt and the Oort Cloud – Sedna, and the Heliosphere which marks a blurry boundary between the edge of our solar system and the start of the rest of space. The average distance to the Kuiper belt is included for reference. What lies beyond Pluto, the Kuiper Belt and Eris? As mentioned earlier, the average person’s idea of the Solar System ends at Pluto. We’ve already seen that we can almost double the size of the Solar System by taking Eris into account, but is there anything more beyond that before we leave our home turf? Indeed there is, and figure 4 shows some notable regions along with their distances from our Sun. At an average distance of 95 AU (or 3.33 football pitches) from the Sun, we find the Heliosphere8. This is a very thinly spread layer of particles (tiny little bits of matter, you can think of it as bits of dust, gas or tiny atoms), but much thicker in size than for example the width of the Kuiper Belt. The Heliosphere is spherical and surrounds the entire Solar System, and is broken into a few overlapping parts. Of most interest are the Termination Shock and the Heliopause. The Heliosphere contains the solar wind and magnetic field of our Solar System, both of which are generated by the Sun. Solar wind basically means particles blowing around in space in a sort of “weather pattern” generated by the Sun. Think of it like rain, but with tiny invisible particles instead, and moving incredibly fast – between 1 and 2 million miles per hour24. The Termination Shock is a recently discovered part of the Heliosphere where, when you cross it, the solar wind and magnetic field drop almost instantly from their normal levels to zero. We were fortunate enough to confirm this discovery because a manmade spacecraft – Voyager 1, launched on 5th September 1977 – amazingly crossed the Termiation Shock in December 2004, and survived to tell the tale. Nobody imagined Voyager 1 would survive to such great distances when it was launched, and indeed very little if anything was known about the Heliosphere’s existence at the time. Voyager 1’s telemetry systems were partially damaged shortly after liftoff so the data we have been able to collect about the Termination Shock event has been very limited. On 30th August 2007, Voyager 2 – which launched on 20th August 1977 and has almost fully working telemetry systems – also crossed the Termination Shock, and will hopefully provide much more detailed information about what is happening in this region of space9. At the time of writing (January 2008), the event data from Voyager 2 is still being analysed, but one thing we have learned is that the position of the Termination Shock is not static – it moves backwards and forwards like waves in the sea – and as such, Voyager 2 was able to cross the boundary several times and take several sets of readings24. The forthcoming Interstellar Boundary Explorer – or IBEX spacecraft – is designed specifically to explore the Heliosphere and the Termination Shock from a distance25. IBEX is expected to launch on 14th July 2008 and begin its research mission in 2009. Beyond the Termination Shock comes the Heliopause, which is the blurred boundary between the edge of our Solar System and the start of deep space. There is no sudden point of exit, just a gradual merging of the Solar System and the rest of space. In the gaps between star systems, including the gap between our Solar System’s Heliopause and the next nearest star system, all the space is referred to as the ISM or Interstellar Medium. On 14th November 2003, an object known as Sedna was discovered. While being over 4 times further away from the Heliosphere at 426 AU, Sedna still orbits the Sun and is therefore considered to be part of our Solar System. Sedna is a dwarf planet – like Ceres, Pluto and Eris – but it is a full 10 times further away from the Sun than Pluto. So for us average people, the discovery of Sedna makes the Solar System a whopping 10 times bigger than it was in our heads before. Are you lost in space yet? Mercury, Venus, Earth, Mars, Ceres, Vesta, Hygieia, Jupiter, Saturn, Uranus, Neptune, Pluto, Charon, Eris, Orcus, Quaoar, Sedna plus a number of other as yet unclassified potential dwarf planets. We have certainly come a long way from our laymen’s idea of the Sun plus 8 or 9 planets! Many of these items have just been discovered in the 21st century and we will no doubt find more before the decade is out. Figure 5. The distance from the Sun to notable objects which lie relatively nearby but outside our solar system. The Oort Cloud is a wide blanket of dust, ice and small rocks believed to be the origin of our solar system’s comet population. Proxima Centauri is our nearest star (like the Sun) at a distance of 4 light years. Gliese 876 d is the smallest planet we have discovered so far outside the solar system (extrasolar planet). Beyond the Heliopause and Sedna come vast distances of empty space. In figure 5 I have shown the distances from the Sun to some notable objects outside the Solar System but still comparatively nearby. Realise that the scale of this graph is a whole magnitude higher than that in figure 4 – I tried to put Sedna on it for reference but it wasn’t even visible as a flat line. The first object shown is the Oort Cloud – at 75,000 AU or just over 1 light year – this is about 170 times further away from the Sun than Sedna, or just under 2,000 times further away than Pluto, and of course, 75,000 times further away than the Earth. In football pitch terms, the Oort Cloud is 2,623 football pitches away – or 262km, so we may well be in the next country or the sea by now. Sedna is actually considered to be part of the Oort Cloud; even though it is much closer to the Sun than the Oort Cloud, it is considered to be far too far away from the Kuiper Belt to be thought of a Kuiper Belt Object. The Oort Cloud is a thick icy blanket full of asteroids and other debris material. What is interesting about it is that it is thought to be the origin of the planets in our Solar System. Over millions of years, bits of the Oort Cloud are thought to have broken away from their orbits and been gently dragged in by our Sun’s gravity. As mentioned earlier, when you get enough bits floating around in a similar orbit, they collide, and sometimes get glued together to make larger bits. When this happens enough, you get a planet. The same process can also happen with gas to form gas planets like Jupiter and Saturn. The asteroid belt and Kuiper Belt could be asteroids that haven’t yet coalesced, or failed to coalesce in the past. The rings of Saturn and the other ringed planets may have come about because Saturn’s (and the other planets’) high gravity pulled in some of the nearby orbiting objects to form rings orbiting itself – preventing those objects from orbiting the Sun and coalescing into new planets. The rings around Saturn and the other ringed planets may eventually coalesce in a similar way to create new moons for these planets. The nearest star system to ours is called Alpha Centauri. Unlike in our Solar System, which just has the Sun, Alpha Centauri contains three stars. Just under four times further away than the Oort Cloud, at 4.22 light years, or 9,512 football pitches, or a leisurely 40 trillion kilometres (40,000,000,000,000 km), the closest star to our own is called Proxima Centauri, also known as Alpha Centauri C since it is part of the Alpha Centauri star system. To the best of my knowledge, it is not currently known whether any planets orbit the stars in this system. Proxima Centauri will not in fact always be our closest star. This is because the orbits of the stars in Alpha Centauri relative to each other mean that one of the other stars in Alpha Centauri will eventually be less than 4.22 light years from us. This won’t happen for a very long time though! A little over twice as far away as the Alpha Centauri system and omitted from the graph in figure 5, is the star system Epsilon Eridani. At 10.5 light years away from our Sun and discovered in 2000, its planet Epsilon Eridani b is the closest known extrasolar planet to us11. Extrasolar just means, outisde our Solar System. This is a rather unfortunate phrase as it places false importance on objects in our Solar System where no special importance really exists. Epsilon Eridani b orbits at 3.3 AU from Epsilon Eridani – about twice the distance from our Sun to Mars. One year on the planet is about the length of 6 Earth years, and the star system also features a belt similar to our Kuiper Belt, and a second planet Epsilon Eridani c orbiting at 37.8 AU – the distance from the Sun to Pluto. Epsilon Eridani c was discovered in October 2002. Three and a half times further away than Alpha Centauri C, at 15 light years, 33,180 football pitches (that’s 3,318km worth of football pitch, or almost half-way round the world), or 140 trillion kilometres, we find another notable star system called Gliese 876. Gliese 876 is notable for having at least three orbiting planets, and in particular Gliese 876 d, which is the smallest mass extrasolar planet discovered so far, with a mass of only 5.88 times the Earth. This is significant because current technology mostly limits us to finding only “giant” Jupiter-sized planets, which are most often made of gas and uninhabitable. New missions such as the Terrestrial Planet Finder12 will shortly allow us to detect hundreds of rocky Earth-size planets in our vicinity, some of which may have conditions favourable for harbouring life. Don’t be fooled by these notes. There are lots of star systems between Alpha Centauri and Gliese 876 which I haven’t mentioned – at least 39 star systems are shown on Wikipedia’s probably inaccurate list of nearest stars13, in the 4-to-15 light year range. 1. Our galaxy (the Milky Way) contains 100s of billions of star systems. In this article, I have mentioned 4 (our Solar System, Alpha Centauri, Epsilon Eridani and Gliese 876). Figure 6 shows what our galaxy might look like from the outside, with all known stars shown accurately. 2. The distance from Earth to the centre of our galaxy is 1,700 times further than the distance to Gliese 876 (26,000 light years, or 57 million football pitches, vs. the mere 15 light years or 33,000 football pitches to Gliese 876). Figure 7 shows a top-down view of our galaxy with the Sun and the centre of the galaxy marked. Figure 8. Galaxy M31 – more commonly known as Andromeda – is the nearest non-satellite galaxy from us, approximately 2 million light years away. 3. The distance from Earth to Andromeda – the next nearest galaxy beyond the Milky Way – is about 77 times further away than the trip from Earth to the centre of the galaxy, or 130,000 times further away than the trip from here to Gliese 876, or 3.2 billion times the distance between the Sun and Pluto. The trip is 2 million light years, 4.4 billion football pitches (at which point the football pitch vs Earth as a grain of salt analogy has become less than useless), or 18.9 million trillion km (18,900,000,000,000,000,000km). Figure 8 shows what Andromeda looks like. The diameter (length) of the widest part of the Milky Way is about 100,000 light years, so another way to think about this is there are about 19 or 20 voids of empty space, each the size of the entire Milky Way, before we reach the nearest edge of Andromeda. That’s alot of empty space! Figure 9. This diagram of our galaxy shows how it is split up into a spiral-like shape with several spiral ‘arms’. Our sun is shown as a circle in the Orion arm (also known as the local arm). The solid lines show areas of the galaxy we have been able to observe directly; the dotted lines show predictions of how far each arm extends that we have not yet been able to measure. Figure 9 is a technical diagram of the Milky Way looking down from above as if it were flat. In fact, the Milky Way is mostly flat in real life (about 1,000 light years tall – 100 times thinner than it is wide), meaning that most of the star systems in it are all on the same plane or axis (the Milky Way is organised like a flat disk rather than a ball or sphere). The exception to this is in the centre, which is called the galactic bulge. Here there is a very high density of stars crashing into each other as well as something called a supermassive black hole which is explained below. We used to think the Sun was at the centre of the galaxy. As figures 8 and 9 show, the Sun is in an insignificant location, about 2/3rds out from the centre in the Orion arm or ‘local’ arm (so-called because it’s the arm where we are located). Our location makes it difficult for us to precisely see the extent of the galaxy, so some areas are just predictions as shown on the diagram. All the stars in the galaxy (including the Sun) orbit very slowly around the centre; as mentioned above, the closer to the centre, the faster they orbit. Our Sun orbits the galaxy at a rather slow 250 km/sec (about 800 times the speed of Concorde assuming it is moving at Mach 1), and takes about 225 million years to make one full orbit of the Milky Way14. This speed is in fact typical for most of the stars not too close to the centre of the galaxy, many of which move at around 210-240 km/sec. Since our Sun is orbiting the centre of the galaxy, so is everything else that orbits the Sun, including us! The time it takes the Sun to orbit the Milky Way is called a galactic year and is a nice way of measuring huge timespans. Going back to our “Universe as a clock” analogy at the start, dinosaurs roamed the Earth about 1 galactic year ago. The Milky Way is thought to be almost as old as the Universe itself, and our Solar System is thought to have existed for about 20-25 galactic years (in other words, the Solar System has orbited the galaxy 20-25 times since its birth). More humbling is the thought that the Solar System has completed just 8/10000ths (8 ten thousandths) of one orbit of the Milky Way since the first humans came into existence. That is to say, humans are 8/10000ths of one galactic year old. 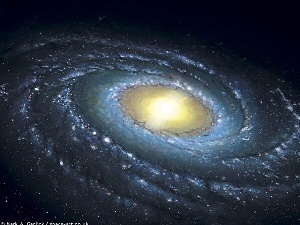 The Milky Way is a typical example of a spiral galaxy. Galaxies come in all shapes and sizes, thin ones, fat ones, thick ones, round ones. Their shapes come about by the way gravity has pulled and sheared them when they were being formed billions of years ago (more about galaxy and star formation in a later chapter). Spiral galaxies are very common and there is nothing special about ours. 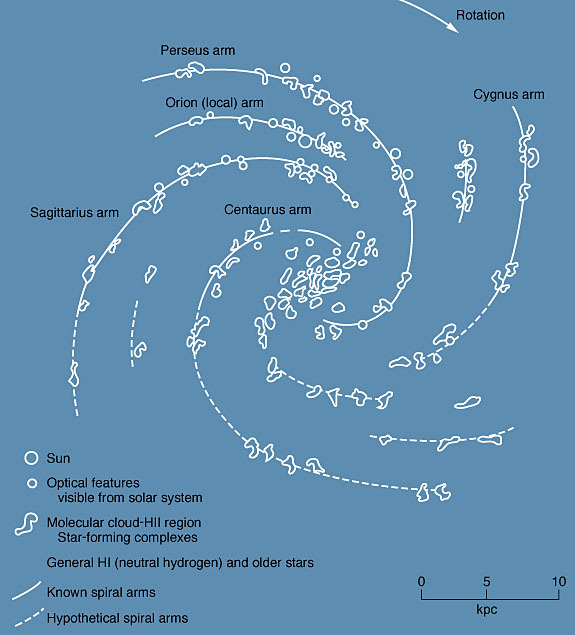 They are typically split into a number of arms (the arms of the spiral) and in figure 9 you can see how we have named the arms in the Milky Way. The online multiplayer game EVE Online has – as far as I know – the largest manmade virtual Universe which can be explored by anybody with a subscription to the game. While EVE’s Universe is dynamic and changing all the time, it currently consists of approximately 5,000 star systems with an approximate diameter of 120 light years. This is the size of the playable area of the game; the background lore associated with the game describes other areas of EVE’s Universe which are currently inaccessible in-game. Here I just use figures for the actual area that has been implemented and can be travelled to by players. This forum thread discusses the approximate size of EVE’s Universe. With such a great number of stars in only 120 light years of space, EVE’s virtual space is far too small to make up even the smallest of galaxies in the real Universe, and the density of stars is also too great. EVE’s Universe could best be described as a small globular cluster like the ones discussed in the article. To give an idea of scale, the Milky Way’s diameter is about 100,000 light years – that’s over 800 times wider than EVE’s Universe. In terms of stars, current estimates of the number of stars in the Milky Way lie between 200 and 400 billion. In EVE, there are about 5,000 star systems and they are all binary star systems, meaning that each system has exactly two stars, for a total of 10,000 stars. See EVE’s jump gate technology backstory page for more details. Therefore the Milky Way has 30 million times more stars than EVE’s Universe. Remember, the Milky Way is only one of several hundred billion galaxies in the known Universe, so the relative size of EVE’s Universe is extraordinarily small. EVE’s Universe can be usefully compared with nearer objects, however. For example, if we take the Heliosphere’s average distance from the Sun (95 AU) as the edge of the Solar System (don’t forget that Sedna is at 426 AU and the Oort Cloud is at 75,000 AU, so the true ‘edge’ is debatable), then the diameter of the Solar System is 190 AU, which is almost 40,000 times smaller than EVE’s Universe. If we take the Oort Cloud as the edge – where the material which formed the Solar System is thought to have originated – then the Solar System is still 50-51 times smaller than EVE’s Universe. EVE’s Universe is also 8 times wider than the distance from our Sun to Gliese 876, which encompasses at least 42 star systems in real-life. A naive assumption that the density of star systems in real life continues in the same way, then we might imagine there are 336 star systems in a span of 120 light years – which is about 15 times less dense than the star systems found in EVE’s Universe (if it has 5,000 star systems). Many thanks to players flashfreaking and D’Hoffryn for taking the time to calculate the diameter of EVE’s Universe. The distances calculated are not precisely straight-line (as the crow flies) distances, but for the purposes of comparison with real life, they are quite reasonable. If we were to look at the Milky Way (or other galaxies) “edge on”, so that we just see a flat line of stars and the bulge in the middle, we would also notice a number of outlying almost spherical groups of tightly packed stars orbiting the galaxy from further away, and not in any part of the spiral arms. These are called globular clusters. They don’t orbit the galaxy on the same axis as the main stars which make up its spiral disk, and they don’t orbit as individual stars but as a self-contained cluster, hence the name. Many galaxies have globular clusters and they are a common feature. Globular clusters might typically contain a few hundred thousand stars (100,000s of stars) and have typical sizes (diameters) of 10-200 light years – thousands of times smaller than the size of the Milky Way, and with millions of times less stars, however the stars are squashed much closer together. The Milky Way has no less than 158 known globular clusters18 and more may be discovered soon. You can think of the galaxy as a souped up version of a star system on a vastly larger scale. At the centre of the galaxy is a supermassive black hole around which all of the stars in the galaxy orbit. This is just the same as how a star in a star system exerts gravity sufficient to keep all of its planets orbiting around it, however a galaxy is billions of times bigger than a single star system of course, and as such the gravity exerted by the supermassive black hole in the centre is much stronger than the gravity exerted by a single star. Recently it has been discovered that even the astonishingly higher amounts of gravity exerted by a supermassive black hole aren’t enough on their own to stop some of the stars from drifting away – however, for some reason, they don’t drift away. The way the stars orbit the galaxy isn’t the same as the way planets orbit stars either. In a star system, planets further away from the star tend to move faster (eg. Pluto moves faster than Earth because it is further from the Sun than Earth, on average). But in a galaxy, stars closer to the centre orbit faster than the stars on the edge! We don’t know exactly why this happens yet, but if the galaxy had more heavy objects in it that we can’t currently see, which were increasing the gravity felt by the stars and helping the supermassive black hole at the centre to keep everything held together, this would explain the stars’ unexpected behaviour. We don’t really know if there is stuff out there we can’t see, but while we figure it out in the meantime, we call the missing substance dark matter. You can think of dark matter as a scientific “fudge” we are using to explain why stars orbit the galaxies in the way they do. 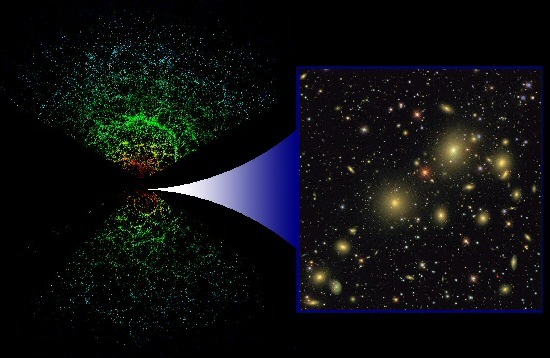 It may be that dark matter exists, it may be that it doesn’t. If it doesn’t, then some other currently not-understood phenomenon exists which will be causing an equivalent affect (altering the expected gravity on stars). For now, you can think of the supermassive black hole at the centre of each galaxy, plus a liberal sprinkling of dark matter spread roughly evenly throughout each galaxy, as the glue holding all the stars together and keeping them in their orbits. I don’t want you to think too much about dark matter floating about right now because its existence has not yet been proven. Black holes are, however, known to be real. The supermassive black hole at the centre of the Milky Way is called Sagittarius A* (abbrieviated to Sgr A* and pronounced “Sagittarius A Star”). I’ll discuss black holes in a later chapter, but one interesting thing about Sgr A* – and other supermassive black holes at the centre of other galaxies – is that you can enter them without being sucked in and destroyed instantly. You will be destroyed, but it would be a much more gentle death and you could even enter the black hole without realising it! In a normal black hole, you would be sucked in and killed extremely quickly before you could even think to steer your spaceship out of the way. Sgr A* is thought to be about 1-2 AU in size (1-2 distances between the Sun and Earth)21, although recent estimates put it as small as 0.35 AU; the black hole is thought to have a mass (heaviness) of a staggering 3,600,000 (3.6 million) times the mass of the Sun22. To put that into perspective, the Sun is thought to make up over 99.9% (999/1000ths) the mass (heaviness) of everything in our Solar System including the Earth and all the other planets, moons and asteroids. When you look up into the sky at night, remember that the Milky Way is so vast that every single star you see in the sky is part of it. No stars you see in the sky are part of any other galaxy except ours. You may be able to make out our nearest neighbour galaxy Andromeda with the naked eye, but you won’t be able to make out any individual stars, and when you’re looking at Andromeda as a little blob, you’re seeing it as it was 2 million years ago. On a good night in a non-polluted area, you can look up and see a shimmering white band cutting the entire night sky in half. This is the centre of the Milky Way, what you are seeing are billions upon billions of stars forming a thick blanket of light in the sky. I have seen this once in my life, late at night when my friend and I stopped during a long road trip across Norway in a town called Oppdal. The sight was so awe-inspiring we both felt completely humbled, like specs of dust blowing in the wind. If you have never seen it, I strongly recommend you take the time to drive out to a dark, clean area on a clear night. If you’ve lived in the city all your life, you may never have seen it at all. Figure 10. The distance from the Sun to notable nearby galaxy-related objects. The centre of the galaxy is over 1,700 times further away than Gliese 876 (included for reference). The Magellanic Clouds are our two nearest satellite galaxies – so-called because they orbit our own Milky Way galaxy – and Andromeda is our nearest non-satellite galaxy. The edge of the known Universe is over 5,000 times further away than Andromeda. In fact, Andromeda isn’t the nearest galaxy to us. It turns out that galaxies can orbit other galaxies! When this happens, the galaxies making the orbits are called satellite galaxies. The Milky Way has 12 smaller satellite galaxies; two of particular note are called the Magellanic Clouds. These are the largest satellite galaxies with the Large Magellanic Cloud at 169,000 light years away and the Small Magellanic Cloud at 210,000 light years away (the centre of the Milky Way is 26,000 light years away). This is about 10 times closer than Andromeda at 2 million light years away, however Andromeda is considered the nearest non-satellite galaxy because it does not orbit the Milky Way and has its own trajectory (path of movement). The Magellanic Clouds are named after their discoverer Magellan in 1519, although they have been referred to in earlier historical texts dating back to 964 AD15. They are so-called irregular dwarf galaxies because they are significantly smaller (dwarf) than the galaxy they orbit, and because they do not have any particular overall shape such as a spiral or disk – they’re irregular in shape. The Large Magellanic Cloud (LMC) is thought to be about 20 times smaller than the Milky Way, and have about 10 times less stars20. In the pilot episode of Star Trek: Voyager, Captain Janeway’s spaceship Voyager was thrown deep into the bowels of space: 70,000 light years from home. This is about two and half times the distance from the Sun (or Starfleet’s home if you prefer) to the centre of the Milky Way if we travel in that direction, or about 40% beyond the edge of the galaxy (if we travel along its primary axis where all the stars are, and assume that the Earth is in the centre, which it is not). The trip home is meant to take about 70 years if the ship travels in a straight line with no technological shortcuts. Voyager travels at an average fictional speed of “warp 6”, so we can deduce that Voyager travels at an average speed of about 1,000 light years, per Earth year. How long would it take Voyager to snoop around the Universe in real life? Voyager can get from the Earth to Pluto in just under 19 seconds. New Horizons will take about 9 years to make the same trip, so if we make the (incorrect) assumption that both ships travel at the a constant speed, that makes Voyager about 1.7 million times faster than the real-world New Horizons craft. Voyager can get from here to our nearest star system Alpha Centauri in a handy one and a half days (about 36 hours), and to the nearest known extrasolar planet in about 3 days. So, we can travel around a decent number of star systems in our region with Voyager. But what about galactic distances? To get to the centre of the Milky Way (where Voyager would eventually be destroyed by the gravity in the supermassive black hole if it travelled inside), Voyager would have to travel for 27 years. In the 24th century, this is probably doable, but to get to the Large Magellanic Cloud would take 169 years, and to get to the nearest non-satellite galaxy Andromeda would take a disturbing 2,000 years. To reach the end of the known Universe, Voyager will take about 10 million years. They will have to work on their warp drives before they can travel galactically significant distances! In real life, it’s not thought to be possible to travel more than 1 light year per man year. This assumes you travel at the speed of light, and it is likely humans will never be able to even approach these speeds, although manmade un-manned probes and spacecraft may be able to reach a fair fraction of this speed in the future. The depressing reality, therefore, is that we’ll never even get to our nearest star in a human lifetime, or even the Oort Cloud at the edge of our Solar System, which is 4 times closer to home. Andromeda – also known as M31 (Messier object 31) – is also a spiral galaxy, and so is nearby Triangulum galaxy (M33). The Milky Way, Andromeda (M31), Triangulum (M33) and their satellite galaxies plus a few other much smaller galaxies make up what is known as the Local Group of galaxies. While Triangulum (M33) is the 3rd largest galaxy, Andromeda (M31) is the 2nd largest and the Milky Way is the largest in the Local Group, the Milky Way and Andromeda are by far the two most massive objects and Triangulum is much smaller by comparison. Andromeda has two main satellite galaxies (M32 and M110) plus a number of smaller more distant ones, all of which are members of the Local Group, and it is not yet sure whether the Triangulum galaxy (M33) is in fact a standalone galaxy or a satellite of Andromeda itself. Andromeda also has lots of globular clusters – 435 were known in the year 200019 – including the brightest one in the night sky, imaginatively named G1. Andromeda is drifting slowly towards the Milky Way at about 140km/sec – nothing to worry about, we’ll be long extinct before it reaches us! When the galaxies collide, it is thought from current models that not too much catastrophic damage will take place; instead, we expect that the galaxies will merge peacefully and combine into one larger galaxy. The Milky Way by itself is thought to be approximately 100,000 light years in diameter; the Local Group of galaxies combined has a diameter of approximately 10 million light years and are considered to be the most nearby self-contained cluster of galaxies. The galaxies and globular clusters in the Local Group are thought to contain about 700 billion stars in total (700,000,000,000). Observing the sky, we’ve learned that the galaxies are not evenly distributed, but are arranged in clusters of galaxies close together, with lots of empty space and the odd stray galaxies here and there in between. Unlike planets, stars and galaxies, which are objects that exist in reality, galaxy clusters are just something we humans made up to help organise our view of space more easily, in much the same way we might organise all our email into email folders; except we can’t actually move the galaxies, they’re already arranged for us! The nearest clusters to us are called Virgo, Fornax and Eridanus. The Local Group (which contains the Milky Way) is far too small to be considered a cluster and is dwarfed in size by comparison. While the Local Group contains about 30 galaxies, the Virgo cluster contains several hundred galaxies. We are not part of any cluster. Virgo, Fornax, Eridanus, and many stray galaxies (including ourselves) and many other smaller groups of galaxies similar to the Local Group – such as the Sculptor Group and Maffei Group – are all part of a 100 million light year wide region of space called the Virgo Supercluster25. A supercluster is just a cluster of clusters – a larger, broader organisational unit. The Virgo supercluster is thought to contain approximately 200 trillion stars (200,000,000,000,000) – almost 300 times as many stars as in the Local Group, and over 600 times as many stars as in the Milky Way. The Virgo Supercluster – as with many superclusters – is named after the largest cluster it contains, ie. the Virgo cluster. Beyond the Virgo Supercluster, our nearest two notable superclusters are called Centaurus and Hydra26. These are found within a 200 million light year range of ourselves, see figure 11. There are also some enormous, relatively empty regions of space called voids, these are shown in the image with red print. 4. 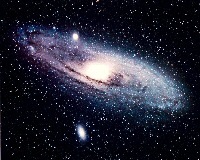 The Universe contains 100s of billions of galaxies just like the Milky Way and Andromeda (see figure 12). 5. The edge of the known Universe is 5,000 times further away than the distance from here to Andromeda – 10 billion light years from here. Figure 12. This picture shows a collection of galaxies indicating what the Universe might look like if we were looking in from far away. You can probably tell that I’ve somewhat given up trying to put the size of the Universe into any kind of meaningful context at this point. You can look at it many ways but you’ll be hard pushed to comprehend it. Take everything you’ve read up until now – upto where we talk about Gliese 876 being 15 light years away. Think about all the non-galactic objects we discussed – the Sun, the planets, asteroid belts, dwarf planets, Heliosphere, the Interstellar Medium, the 42 known star systems between and including Alpha Centauri and Gliese 876 each with their own orbiting objects, some with planets, some with more than one star. Now multiply all of that by 666 million (from 15 light years – the distance to Gliese 876 – to 10 billion light years – the distance to the edge of the known Universe) – oh, wait, do you know how much 666 million is? Well, if you do, and you can imagine everything we’ve talked about repeated 666 million times, you’ve successfully imagined the size of the Universe (obviously, the rest of the Universe is not just a repeat of what is nearby over and over again, it is the principle of scale I want to illustrate). Figure 13 shows recent results from the Sloan Digital Sky Survey, a well-known and prestigious project to fully catalogue all the galaxies in the Universe. Not only have they produced the kind of imagery shown in the figure as part of this mammoth task, but they have also created a kind of 3D flight simulator whereby you can fly around the Universe and look at the sky from the point of view of any other known star or galaxy. Among other things, this lets us imagine how aliens might see the night sky on their home planets. SDSS currently have about 2 billion galaxies catalogued – they’ve got a long way to go, this is less than 1% of the known Universe!To add insult to injury, you’ll notice I have always written “known Universe” when referring to the edge of the Universe. This is because we can’t and won’t be able to see items beyond a certain ‘horizon’ point in the distance: when we look at a galaxy 10 billion light years away, the light has taken 10 billion years to reach us, so we are looking at the galaxy the way it was 10 billion years ago, not how it is now (for more information see the chapter on light). Most galaxies are moving away from us and we are moving away from them. Nothing can travel faster than light according to conventional wisdom, so if the combined speed we are moving away from Some Distant Galaxy, plus the speed Some Distant Galaxy is moving away from us, exceeds the speed of light, then the light from that galaxy will never reach us and we will never be able to detect it. Because of this phenomenon, the Universe may be significantly larger than what we will ever be able to see even with the most powerful space-based telescopes. We can, however, make inferences about the Universe’s total size and mass using sophisticated indirect measuring techniques, and in the next few years, new space-based telescopes will allow us to see as far away as 14.5 billion light years, which is significantly further than today. At that point, we will be able to see “back in time” and look at protogalaxies, which are galaxies still being born that haven’t properly formed yet. Of course, by now, they have; we’ll be looking at them as they were 14.5 billion years ago, just 500 million years after the approximate birth of the Universe itself. This will give us amazing new insights into how the Universe evolved. 4 – What is the diameter of the Sun? I know you said that you’re rounding, but rounding the age of the universe from 13.7 billion years to 15 bugs me a little. Also, you put the edge of the known universe at 10 billion light years. Actually, the universe is expanding faster than the speed of light. While nothing in the universe is moving faster than the speed of light, there’s more of whatever-space-is between the things in the universe. The raisin bread metaphor is the one that I find easiest to picture. http://www.pbs.org/wgbh/nova/physics/blog/2012/10/how-large-is-the-observable-universe/ That page lists it at 42 billion light years. I’ve seen mainstream science articles in the past that put it as high as 156 billion light years.